Grails is not only a web framework but a complete development framework which runs on top of JVM.It uses convention over configuration which makes it different from most of the frameworks which require alot of XML configuration. There is no need to use XML to configure various things while creating an web app using Grails. When application is created initially using Grails, it creates various directories in the project which are meant for specific things. For example , it creates folders like spring,hiberante,domain,controller etc where the specific files should be placed and application will automatically pick those up.Also Grails provides utilities to create domain classes and controllers which gets created and also gets copied to the directories which are meant for them. Isn't this wonderful. This saves alot of development time and is the beauty of framework. Install Grails on local computer. Creating first Application on grails. Running the Application created in step 3 on local host . Go to http://grails.org/Download and download the latest release of Grails. At this point of time the latest release is Grails 2.1.0. Extract the downloaded Grails distribution into a folder. 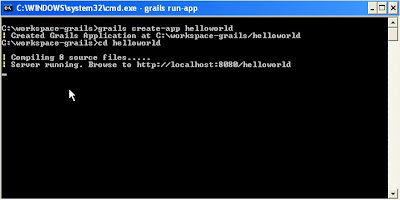 Create a GRAILS_HOME environment variable that points to the path where the Grails archive was extracted. Append the GRAILS_HOME\bin directory to the PATH environment variable. Below is the output of the above command. 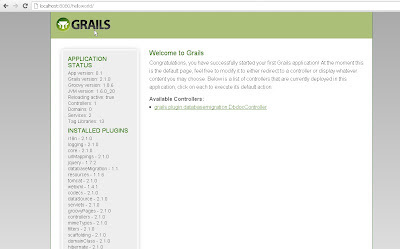 Now our Grails is working fine, lets have a feel and create first project(webapp) in Grails. 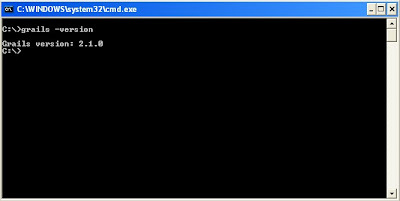 For this go to the workspace folder (c:\workspace-grails) from the command prompt. After that to create a new project issue following command at the prompt. The output mite be different if you haven't created/used Grails previously as it loads all the dependencies first. After successful execution of above command you can see that there is a directory(project) created. The directory is having various sub-directories for different types of files. Now in order to run the newly created application , change directory to "helloworld". Now in order to run the application, start the server by following command. 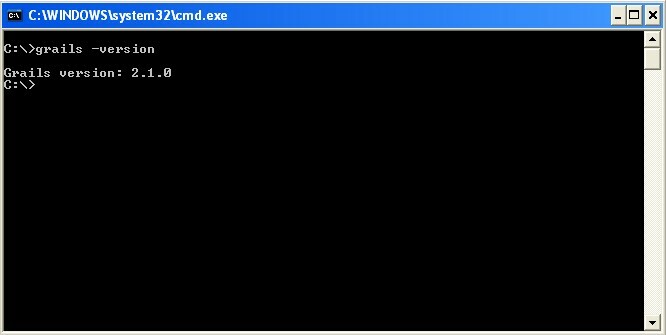 Below is the command and output. Access the http://localhost:8080/helloworld/ link and check that Application successfully. So that is it. 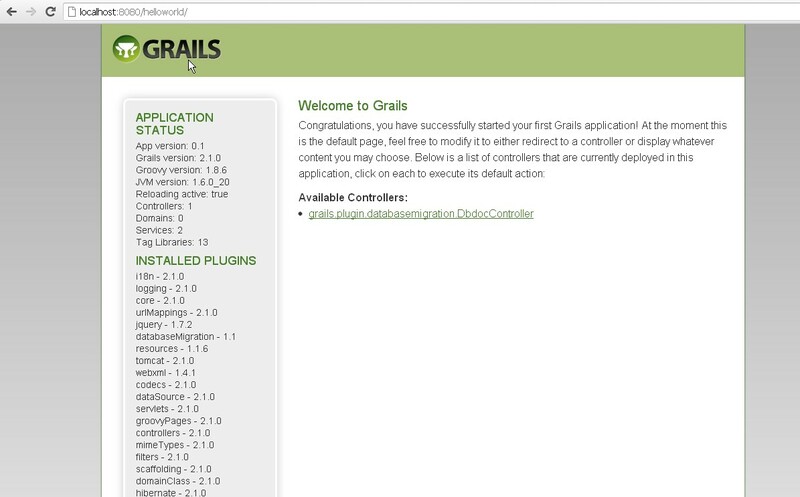 Grails is successfully installed on local computer and first project on Grails is up,running and ready to add some more functionality. We will look how to add more functionality in this project in next post on Grails. Hope you liked the post and had a feel of Grails. BlueHost is the best web-hosting company for any hosting services you might need.